Since 2007, Julianne Matthew Bass has been the lead fund's manager of this USAA fund. The fund’s expense ratio is 0.91% per year. The average expense ratio of this high yield bond fund is 1.17%. As part of no load fund, this USAA high yield fund doesn’t have any sales load (i.e. front sales load and deferred sales load). The fund’s total net assets are $1.6 billion. The fund also has a dividend yield of 7.08%. 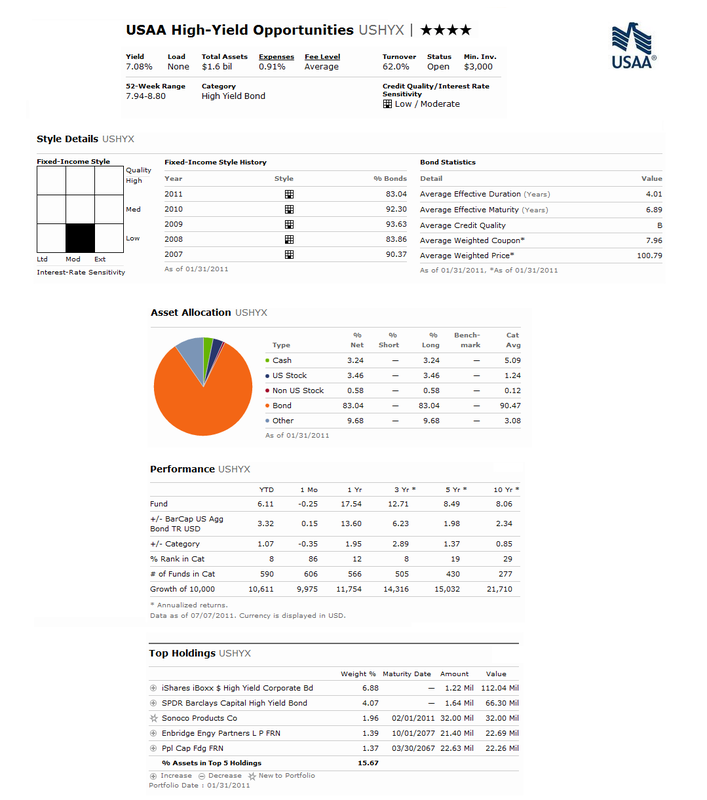 As part of taxable bond fund, this USAA High-Yield Opportunities fund has 4-stars rating from Morningstar. The best 1-year total return was recorded in 2009 with 54.19%. The worst performance year occurred in 2008 with -28.09%. It has returned 19.84% over the past one year and 8.65% over the past five years. This fund is available in another class such as UHYOX. This UHYOX fund has higher expense ratio with 1.20% fee per year. The fund has been open to investor since 1999. 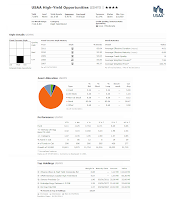 Investor can invest in this best fund with $3,000 minimum investment balance for regular brokerage account and $250 for retirement account (IRA). USHYX fund can be purchased from 20 brokerages include Pershing Fund Center, TD Ameritrade, T Rowe Price, JPMorgan, TIAA-CREF Brokerage Services, Ameritas NTF, Dreyfus NTF,etc. The top five holdings of this fund as of February 2011 are iShares iBoxx $ High Yield Corporate Bond, SPDR Barclays Capital High Yield Bond, Sonoco Products Co, Enbridge Engy Partners L P FRN, and Ppl Cap Fdg FRN. The fund top 5 sectors include US Corporate bond (86.17%), Foreign Corporate (8.24%), Asset Backed (2.76%), Mortgage CMO (2.4%), and Municipal (0.37%).